If any two lines in the plane are drawn, they are either parallel or intersecting. How do you know if a line is parallel? Hence the lines y = m1x + c1 and y = m2x + c2 are parallel if m1 = m2. 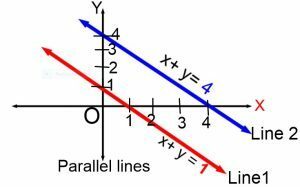 In fact, two parallel lines differ by a constant. Hence if the equation of line is y = mx + c, then, equation of a line parallel to it is y = mx + k, where k is a constant. To find the particular line, we require a unique value of k. For this additional condition is given. Example 1: Write the equation of a line parallel to y = 7x + 10. Using the above concept, the equation of a line parallel to above line is y = 7x + k, where k is any real number. Example 2: Write the equation of a line parallel to y = 7x + 10 which passes from (1, 1). The equation of a required line parallel to above line is y = 7x + k, where k is any real number. Since the above line passes from (1, 1), hence it satisfies the required equation y = 7x + k.
Hence, 1 = 7(1) + k and k = 1 – 7 = -6. Hence, the required equation is y = 7x – 6. How do you know if a line is perpendicular? Example 3: Find the equation of a line perpendicular to y = 2x + 5.
x+k, where k is any real number. Example 4: Find the equation of a line perpendicular to y = 3x + 5 passing from (1, 2). As, done in the previous example slope of given line is m = 3. (1) If two lines are parallel,then their slopes are equal. (2) If two lines are perpendicular,then product of their slopes is -1. To find the slope of a line perpendicular to given line,We take the reciprocal and change its sign. Hence,slope of a line perpendicular to a given line with slope m is -1/m. Example 5: Check whether the lines x + y = 10 and x + y = 100 are parallel or perpendicular. The slope of first line, y = (-1)x + 10 is m1 = -1. The slope of second line, y = (-1)x + 100 is m2 = -1.
m1 = m2 = -1. Hence the given lines are parallel. Example 6: Check whether the lines x + y = 10 and x – y = 100 are parallel or perpendicular. The slope of second line, y = (1)x – 100 is m2 = 1.
m1 m2 = -1, so the given lines are perpendicular. Find the equation of the line passing through (-1, 5) & parallel to the line y = 5x + 1. 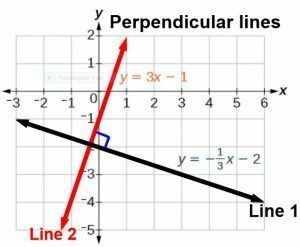 Find the equation of the line passing through (-1, 5) & perpendicular to the line y = 5x + 1. Check whether the lines, 3x + y = 15 and 21x + 7y = 28 are parallel or perpendicular. Check whether the lines 3x + y = 15 and x – 3y = 28 are parallel or perpendicular. Find the equation of the line parallel to the line, y = 7x + 51. Find the equation of the line perpendicular to the line y = 7x + 51. The required parallel line is y = 5x + 10.
or x + 5y = 26. Since, slopes of the two lines are equal which is -3. Hence the given lines are parallel. Since, product of the slopes of the two lines is -1. Hence the given lines are perpendicular.